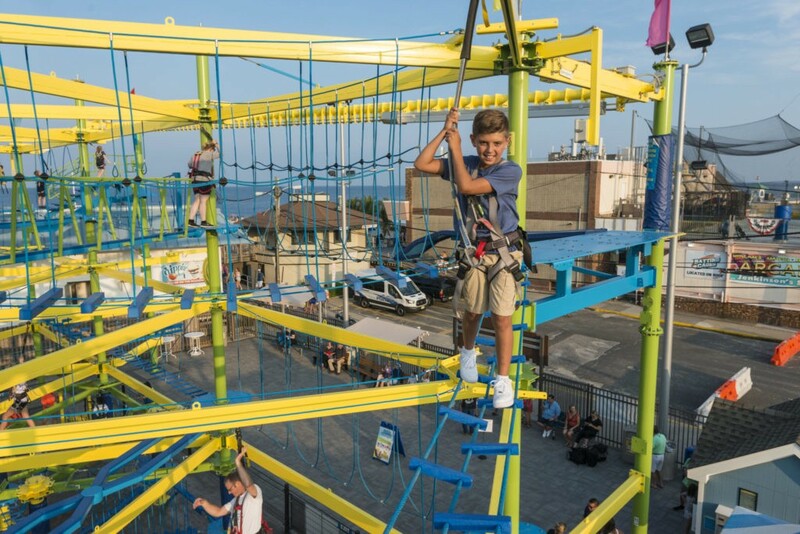 The larger, two-level course has 25 thrill elements including a chance to ‘walk the plank,”, a zip-line, and a peak of 36 feet with a stunning beach and ocean view. Adventure Lookout Prices: $14 (28 Credits) for Adventure Lookout Course & $7 (14 Credits) for Jr. Adventure Course. We also offer Adventure Packages, group rates and add-ons! Please note: All “Adventurers” must wear proper footwear such as sneakers or closed toed shoes. Due to the risk of abrasion, tank tops are not allowed on Adventure Lookout. Shorts/Pants should also be worn, no dresses. Participant maximum weight is 3000lbs. Open-toed, flip-flops or open-healed shoes are not permitted. Participant must wear appropriate attire. Shirts and pant/shorts required. Skirts, dresses and bathing suits are NOT permitted. All pockets MUST BE EMPTY. No cell phones, cameras or loose articles are permitted on the course. No gum, food or drinks are permitted on the course. Only one participant per element at a time, unless with a chaperone. No running, jumping, hanging or horseplay at any time. Sling line rope must remain in front of you at all times. Do not touch the overhead tracking. Do not tamper with your harness or sling line.